It never fails…when Christmas is over, I come across ideas I wish I had seen earlier in the season so I could have tried them out. Well, I’m saving these ideas for next Christmas! Maybe you’ll find something here you’ll want to try next year, too! 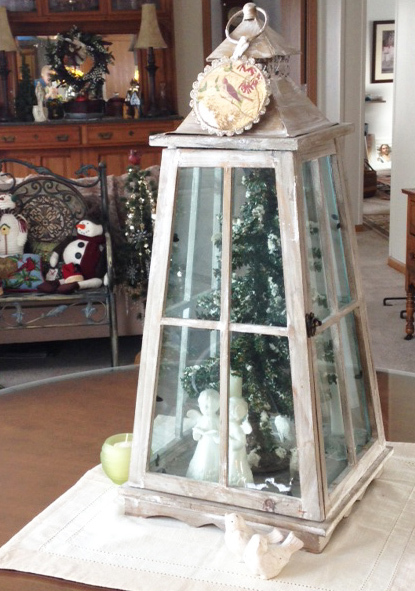 From My Picture-Perfect Life–Top photo: display ornaments in a variety of glass containers or covered plates or stands. Even larger vases work great! 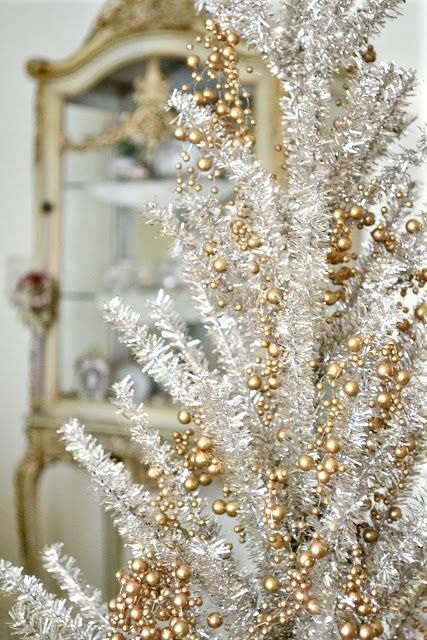 Bottom photo: Silver and gold are a great combination–add fullness to a silvery Christmas tree with decorative gold stems. 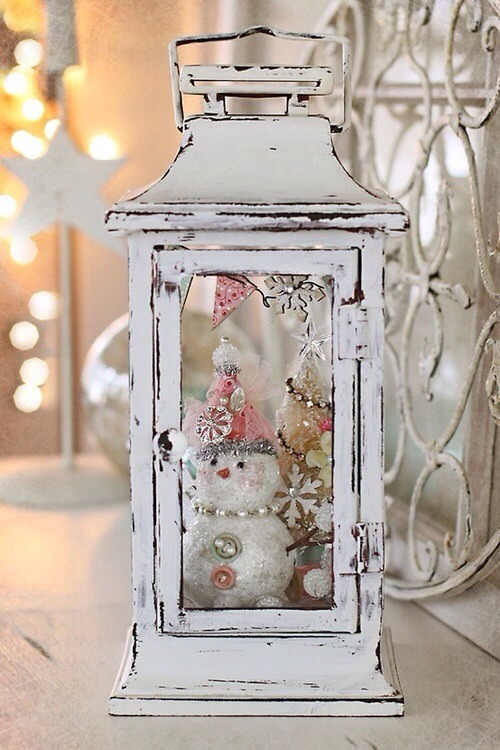 From A Fanciful Diversion–a Shabby Chic lantern filled with a collection of snowy, glittery treasures. 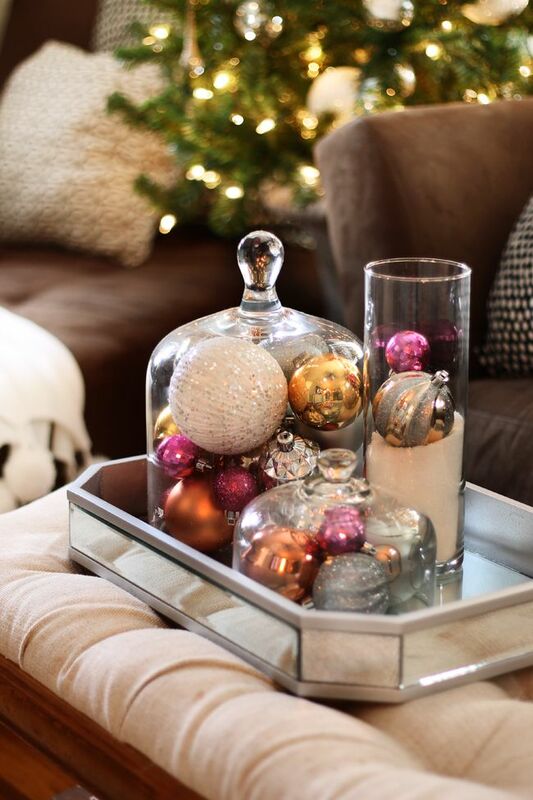 My artistic friend Eileen had a similar idea this Christmas, making such a pretty arrangement, above, on her table! 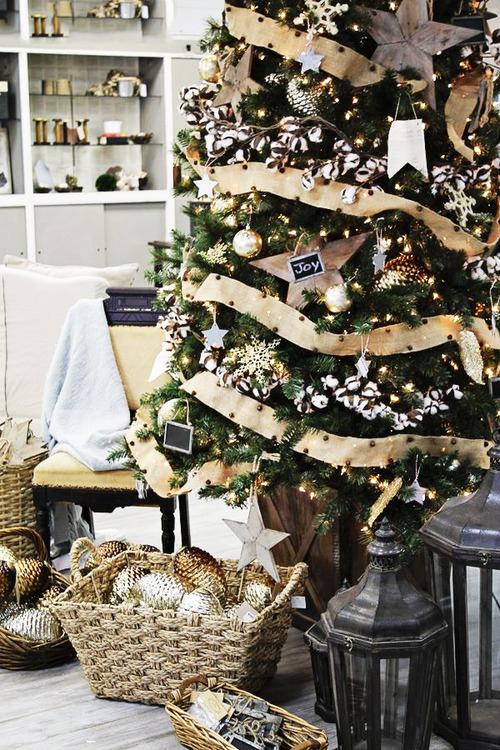 From Carpe Diem–Glttery gold ornaments paired with rustic and natural elements–and more lanterns surrounding the bottom of the tree. 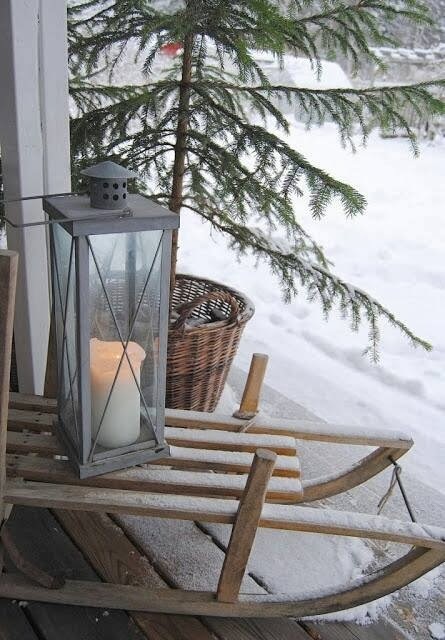 Love this outdoor lantern on a vintage sled–from Self Architecture. Gives any porch a warm and welcoming look! A great way to add a touch of Christmas to bedrooms–hang stockings at the foot of the bed and add a Christmas pillow on top! 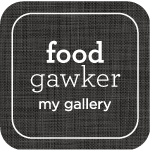 From Passion Decor. 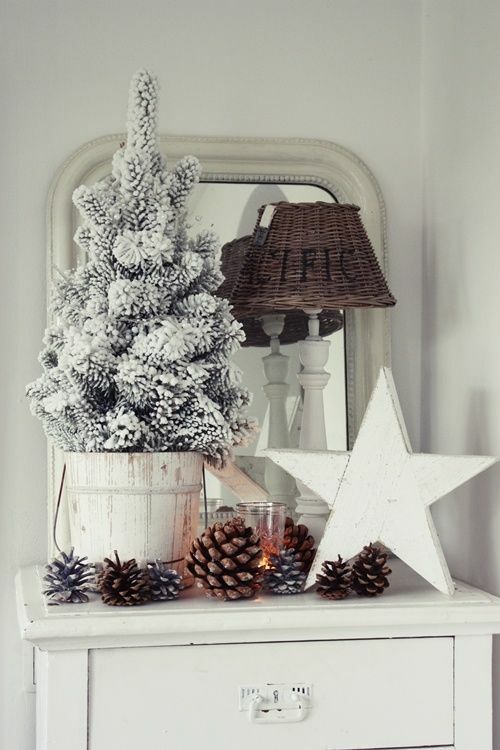 Top photo: Pinecones go great with the other rustic decor in this Shabby Chic display, from Seda y Nacar. 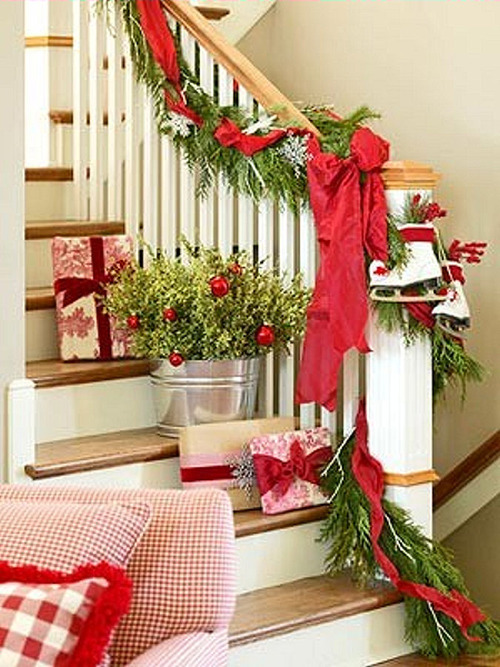 And from the same site, a festive bannister with gifts and greenery. 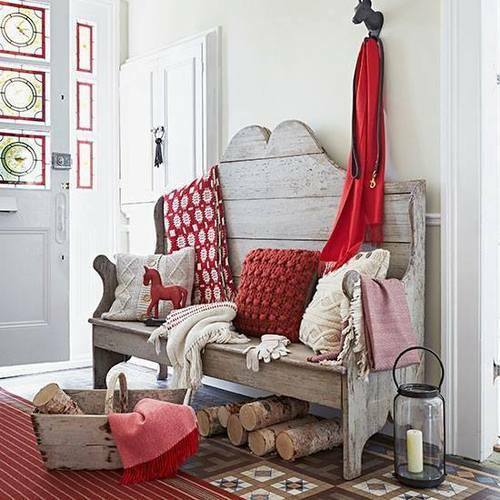 What a cozy entryway from Texstil Design! 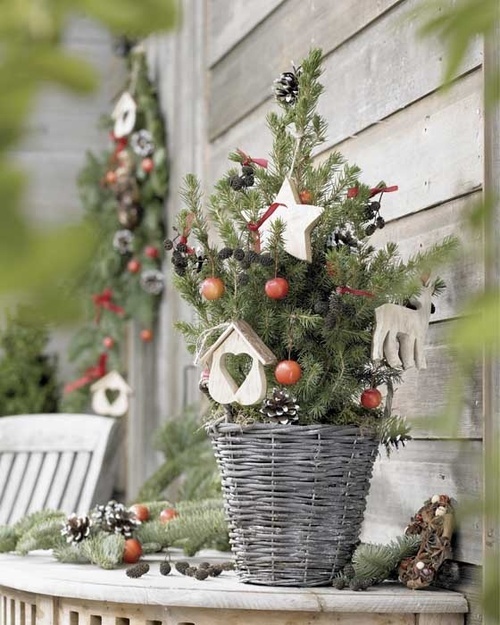 Cute little Christmas trees add a nice touch on tables indoors or out. From Jaynes Cozy Corner. A glowing, golden vintage village warms up any room. From Old, but gold. Well, we will sure be prepared for next Christmas, won’t we? 🙂 Have you collected some ideas you are saving for next Christmas? 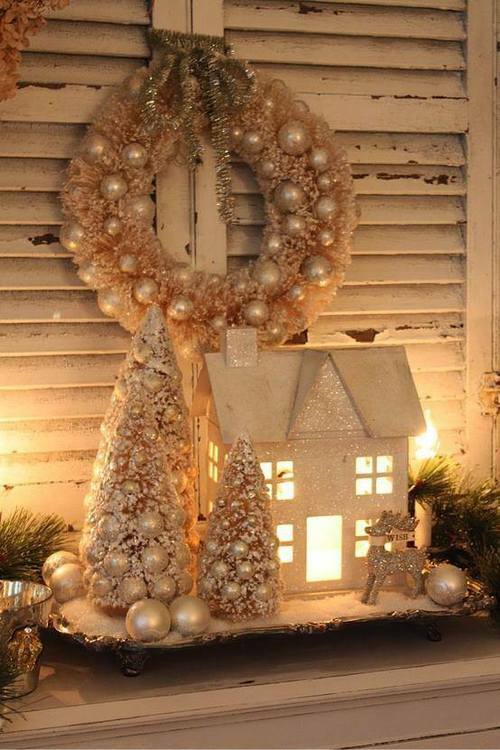 This entry was posted in Creative Inspiration, Decorating Ideas, Seasonal, Winter/Christmas and tagged Christmas, decorating, Holidays, Winter on January 4, 2014 by nancyc. I will have to book mark these ideas for next year! Wishing you a super 2014! You’re right–it never hurts to plan ahead for next Christmas! 🙂 Hope you are having a nice Sunday afternoon, too!